Eating bugs is nothing new. Ento-enthusiasts have long extolled the virtues of insect cuisine, bugs being cheap, high in protein and readily available. Now they’re also raving about its medicinal properties. 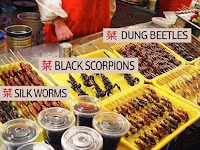 The Imperial Herbal Restaurant in Singapore offers dishes featuring scorpions and ants, both of which are high in nutriens. Although there is no conclusive evidence, both reputedly combat illness as well. According to the restaurant’s proprietor, Mrs. Wang-Lee Tee Eng, scorpion’s poison soothes nerves and eases migraine headaches, while ants cure rheumatism, a condition which causes inflammation of the joints, muscles or ligaments. The Bangkok Post reports that the Division of Medical Entomology is compiling a list of insect products that have medicinal properties. Among them: dried grubs which relieve pain and increase heart-rate after poisonous bites; cicada larvae which relieve gas, cold sores and measles; and dried hornet’s nest, which kills parasites and relieves gastrointestinal pain. Royal Jelly bee’s pollen is also believed to lower blood pressure and improve skin quality. Those searching for a tasty meal made of bugs, however, might need to look elsewhere. Scorpions have a chewy texture, while ants have a sour tang like vinegar. It’s an acquired taste.